You men out there, I just need to warn you that this entire post may fall under the category of "Too Much Information" or under the category of "chicks'-stuff-and-the-strange-things-we-as-men-have-never-even-thought-might-be-issues-for-women-when-running." If you do not desire to read more about things in these categories, then please feel free to skip this one. For all of the rest of you out there, may I bring to your attention, THE RUNNING SKIRT. Yes, SKIRT. (or skort, depending upon the whim of the marketing departments in the running world). Ah, how I LOVE my running skorts! They look like a skirt, but have spandex compression shorts underneath. I used to run in shorts. I never particularly enjoyed my shorts, although some were cute to wear. I did particularly NOT enjoy how my shorts would start to ride-up as I ran, especially if I was going uphill. I spent several minutes of my runs just pulling the legs of my shorts back down, over, and over, and over. SO annoying! Then, several months ago, I read an article in one of Macon's "Runner's World" Magazines about running skirts. I think that it was written by Kristin Armstrong. Anyways, I had always thought that if I saw a woman in an athletic looking skirt, then she must be going to play tennis. Little did I know that there is an entire movement out there in the athletic world making skirts for running, cycling, golf, etc. 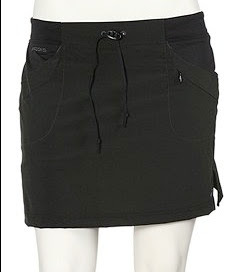 After reading the article, I did a little web surfing and discovered a couple of skirts on sale at sierra trading post. I was able to get my first running skirt for $25 (instead of the normal $60 that this particular skirt usually sold for). It is the "Brooks Motion Skort". It is last season, so it is harder to find, but it ROCKS! This skirt continues to remain my favorite. It is just a bit longer, it has a pocket sewn into the leg of the compression shorts underneath where I can put my key, and a pocket in the skirt where I can put my phone/mp3 player. The most wonderful part of running in this is that I don't have to pull my shorts down over and over and over again. I just run and since the compression shorts are not riding up all the time, I don't even think about them. Of course, it is also fun to wear something that is cute and a little bit feminine while I am getting so hot and sweaty. This skort idea strikes me as really great because it serves both form and function well. Anyway, since I loved this skirt so much, I invested in some skirts from Hind (also found at sierra trading post). These were a little shorter, and although they are comfortable, I find that I miss having the pockets which my Brooks skort has. On Saturday, Macon and I ran in the SkirtChasers5k. The skirt that I got for registering was a very very cute little number that even had little snaps on the waistband where you can hang your race number. No more need for safety pins at the race! However, while it was a fabulous red, and while it was so very light that I almost forgot I had anything on, there were at least two drawbacks. The "boy shorts" underneath this skirt are not compression shorts and before I had even started running I was very aware of the tendency of these shorts to ride up and cause quite the "wedgie." Also, because the skirt is SO light, when you run it bounces up higher than my others and reveals the boy short wedgie underneath from time to time. Oh, and because the boy shorts do not stay down, there is the issue of leg chafage. OUCH. After three+ miles, your skin can cause itself some damage from the friction of your legs rubbing together. For those of you who have legs that do not rub together, congratulations! That's wonderful. For those of you, like me, who do have this issue, this skirt from "SkirtSports" may not be the one for you. P.S. 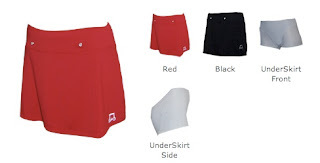 After washing the skorts a few times, the compression shorts may begin to have the tendency to ride up a bit, but the secret to fixing this is to sweat just a little and then pull them down to where you want them. The sweat will hold them in place for the remainder of the run/walk. P.P.S. 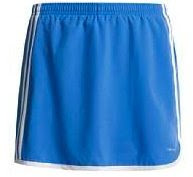 Several of the running skirts do not have compression shorts underneath, they merely have "spankies" or briefs. "Spankies" are similar to briefs. Sometimes they are the same as briefs, and sometimes they fit more loosely, it depends on the company making them. If you are someone with teeny tiny legs that do not rub together then spankies or briefs underneath may work great for you. If you are not, then I cannot recommend having spandex compression shorts underneath enough. Sometimes in order to find these, you have to search for "athletic" skirts or "motion" skirts (or skorts) instead of "Running" skirts/skorts. Just wanted to add that a site called "team estrogen"
http://www.teamestrogen.com/product/apparel/bottoms/skorts/c0-c1-c24-c127-p1.html has lots of different skorts in stock. I'll be sure to add it to the Christmas list.